The Lakeside Hammers had a disappointing defeat to King’s Lyn Stars 45-48 in front of the Sky cameras at Arena Essex Monday. Neil Vatcher put their loss down to “too many riders didn’t win enough heats” as they lost an eleven point lead and top spot of the Elite League, which could be a vital meeting come end of the season. King’s Lyn Stars used rider replacement for the evening sharing rides in place of Kenneth Bjerre who was out injured, which made the difference as Neils Kristian Iverson rode the last four of the six races. The Hammers bumped in to an in-form Neils Kristian Iverson who took heat one off Richard Lawson going into the last lap and snatched a 3-3 as Peter Karlsson slipped in third. Heat two was much of the same as Lewis Kerr won with ease with Adam Ellis and Ben Morely unable to chase him down for another split race. The following heat had The Hammers first win as Captain Davey Watt came through but Mikkel Bech was unable to assist him, as both sides were level. King’s Lyn gained the first advantage in heat four as Nicklas Porsing gated quickest and won as Lewis Bridger got second but Lewis Kerr grabbed third to give the visitors the edge at 11-13. Races five and six were level but the visitors won both heats as Rory Schlein and Iversen again won from the first bend with The Hammers unable to find a way past the King’s Lyn front runners. Heat seven was the revival for the home side as Richard Lawson revved to victory followed by Adam Ellis. Lewis Rose fell early in the race and 15 year old Robert Lambert had a mechanical problem but decided not to pass the finish line, until influenced by his team to get the point which was stripped from them giving The Hammers a 5-1. Race eight swept up another 5-1 for the home side as Davey Watt won and Lewis Bridger’s overtake early on over Rory Schlein gave The Hammers a 27-20 lead. Heat nine was a third conceutive 5-1 for the home side as Ben Morely won with ease and assisted by Adam Ellis. However the tide turned in the tactical ride as Iverson was slipped in to blow the home side out the water and bring the visitors within six as they got a 2-7 win. Iverson rode again in heat 11 and won his fourth of the night backed up in second by Robert Lambert to bring them within two points at 35-33. The Hammers restored some calm as Richard Lawson won race 12 and was aided by a great race from Ben Morely to open their lead back up to six. The former Moto GP rider Iverson won his fifth race in the meetings final stages and nicked a 4-2 heat victory to close the gap again. Race 14 summed up the night for The Hammers as Adam Ellis fell on the last bend of lap two but the referee awarded the 5-1 heat to the visitors for Robert Lambert with Lewis Rose in second. The final heat was all level at 43-43 giving King’s Lyn the fortune of a guaranteed point before the race. The away side took inspiration from their secured point and snatched all three match points as Iversen made it a maximum 21 points and got a 4-2 last race win with Schlein in third, to conclude the match at 45-48. This entry was posted in Speedway, Sport and tagged Ben Morely, Elite League, King's Lyn Star's, Lakeside Hammers, Neils Kristian Iversen, Richard Lawson, Rory Schlein, Speedway. 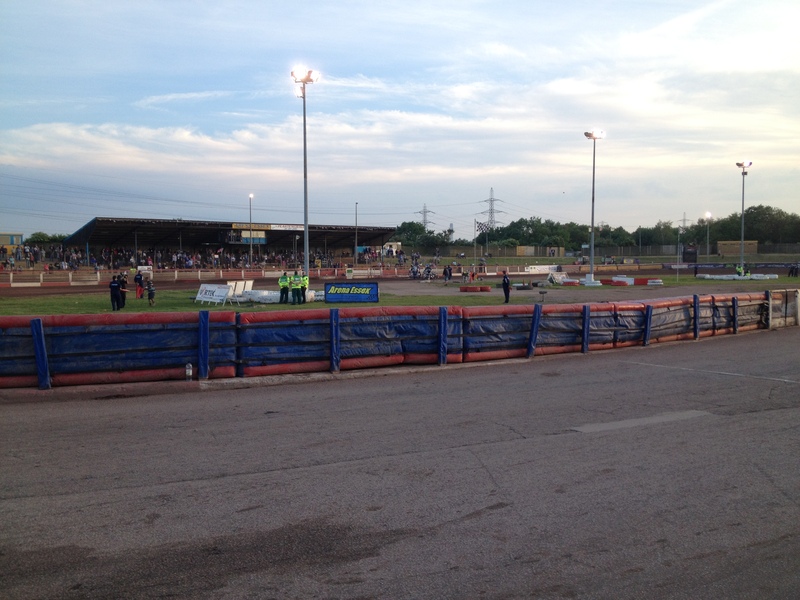 The Lakeside Hammers continue their fine home form as they tame Wolverhampton Wolves 53-40 at Essex Arena on Friday. The Hammers stay top of the Elite League and maintain the three point gap between them and King’s Lyn despite playing vastly more meetings than the chasing pack. The opening heat was eagerly anticipated with the arrival of World Champion Tai Woffinden but Richard Lawson got out in front and dominated the race picking up the win with Woffinden struggling splitting heat one three apiece. The Hammers put their foot on the gas and stretched to an early lead as Adam Ellis won heat two with Ben Morely who had to scrap for second place against Ashley Morris. Captain Davey Watt guided his side to consecutive 5-1 victories as he won race three with guest for Mikkel Bech, Scott Nicholls to hold off Ricki Wells to gain a 13-5 lead. 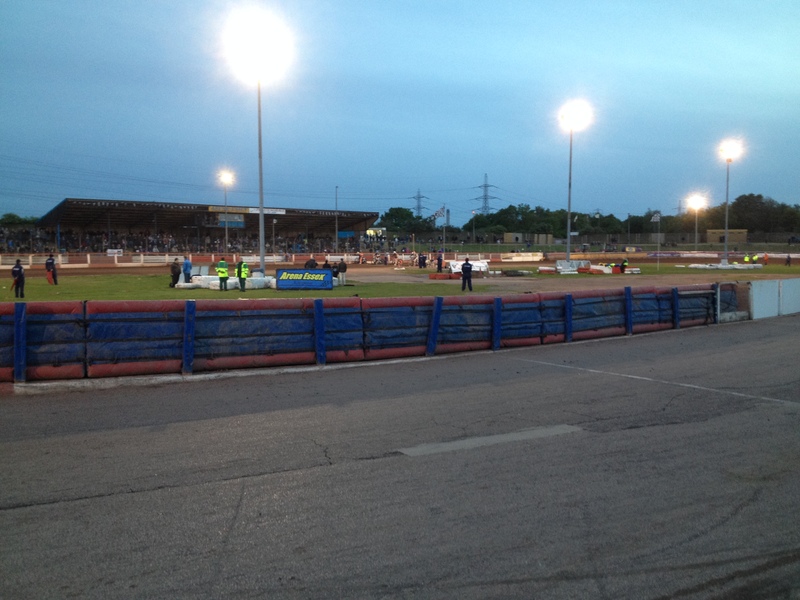 Heat four was split as Lawson stormed to victory whereas Morely was blocked out by the visitors. The home side extended their advantage as Peter Karlsson went round the outside of Scott Nicholls on the last bend to take the race win as well as a 5-1 to increase their margin to 12 at 21-9. The away side put the tactical ride to good use as Piotr Pawlicki and Woffinden picked up a one two and an 8-1 heat to bring it back to within five. The Hammers edged heat seven as Richard Lawson gained his second win of the night with Ellis also picking up a point. The Hammers got back to 5-1 race wins in heat eight after the stoppage for Jason Thorsell who fell, as Davey Watt and Lewis Bridger picked up maximums points to maintain the away sides deficit. Heat nine was split as Ben Morely revved to victory but Ellis despite accompanying Morely for three laps his chain snapped on the last lap. Race ten was a rare away win for Pawlicki narrowing the score to within nine points. The last four heats were about consolidating the three match point and heat 11 was split as Davey Watt won the race but guested Nicholls span on lap three. Race twelve involved the two in-form riders for The Hammers as Richard Lawson sped to victory with Morely in second to extend their lead to 13 at 44-31. With the final three heats the World number one won race 13 and got a 4-2 to bring the score back to 46-35. In heat 14 Adam Ellis was swapped for Ben Morely as the safer option to make sure of the win as Bridger and Morely came through with another 5-1. The final race made it three wins out of five for Pawlicki with Nicholls picking up second to bring the score to 53-40 and continuing The Hammers unbeaten home run, ahead of their next home game against King’s Lyn in the sky meeting this coming Monday. The Hammers next meeting is away to Poole on Wednesday night and looking to improve on their latest away results despite their good performances. This entry was posted in Sport and tagged Ben Morely, Davey Watt, Elite League, Lakeside Hammers, Richard Lawson, Scott Nicholls, Speedway, Tai Woffinden, World Champion Tai Woffinden, Wovlerhampton Wolves. 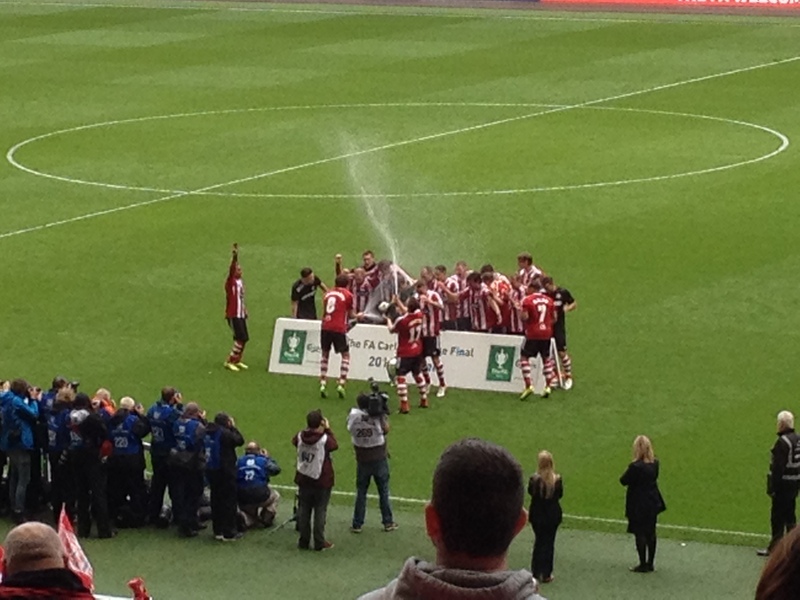 Sholing FC beat northern opponents West Auckland Town in a tense affair as Marvin Mclean’s goal separated the two sides and gave ‘The Boatmen’ The FA Vase Trophy for the first time. The Wessex Premier side Sholing, three tiers below West Auckland matched them throughout and the five employees of Dave Diaper’s side as electricians put their bodies on the line for the victory. West Auckland had the first opportunity of the contest five minutes in as clinical John Campbell was slotted in on goal but goalkeeper Matt Brown blocked the shot. Sholing then responded with Lee Wort who already has 44 goals to his name this season. Ten minutes in he used his strength to beat Darrly Hall and his tight angled shot was saved by Jordan Nixon. Just after the half hour the speedy winger Marvin Mclean was put through, as he beat the left back Neil Patterson for pace but he put his shot high and wide. Minutes before half-time a central free-kick for John Campbell was heading in to the top left corner but for another great save by Matt Brown denied the lead for the northerners. The rain poured at the start of the second half but Barry Mason sparked up the southerners as he beat the right back for pace and got his shot away but Jordan Nixon palmed it away from danger. Sholing’s Marvin Mclean broke the deadlock with an important goal as he sprinted on to a long ball, took a touch and his shot deflected over Jordan Nixon and in to put Sholing 20 minutes away from lifting the trophy. West Auckland nearly grabbed an equaliser ten minutes from time through Dennis Knight’s free-kick, on the edge of the box but was denied by a finger-tip save from man of the match Matt Brown. In injury time West Auckland almost forced extra-time as a deep ball into the box was headed by Lewis Galpin onto the bar but Sholing’s never say die attitude, cleared the chance to give them the victory moments later. This entry was posted in Football, Sport and tagged FA Vase, Football, Sholing FC, Wembley, West Auckland Town. The Lakeside Vortex Hammers clinched all three points after a 51-44 victory over Coventry Bees last night and maintain their unbeaten home run at home despite a tense last few heats. The Hammers stay top of the Elite League as they continue for their play-off aspirations come to the end of the season ahead of the chasing King’s Lyn. The home side normally stretch out to early leads in their last home games but Hans Anderson had other ideas as he gated quickest and won heat one, to give the visitors a 4-2 lead as Fricke picked up a point. Race two was key for The Hammers when it came to the final score as Jason Garrity for the visitors was flying but Steven Worrall was determined to peg him back. Coming off the last bend had the momentum and sneaked past him by a tires width to take a vital victory. 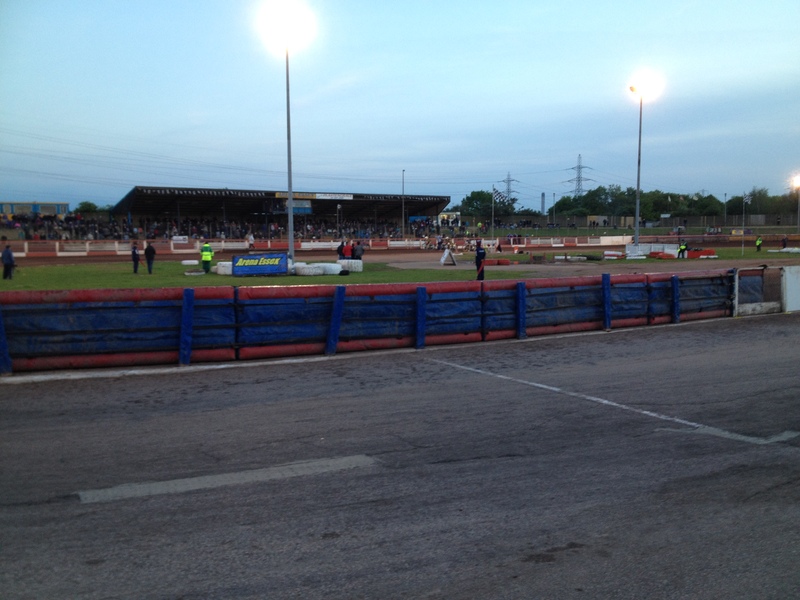 The home side then got going getting a 5-1 as Davey Watt set the fastest time of the season at Arena Essex of 58.8. Mikkel Bech then won the following heat to take a 4-2 as Ben Morely grabbed 3rd. Heat five was probably race of the night as Peter Karlsson went past Ryan Fisher on lap 2 and steamed ahead to win. Lewis Bridger came from 3rd to take 2nd on the last bend as he gambled out wide round the outside and held it well to take another 5-1 to give the home side 19-11 lead. Davey Watt secured another heat win in double quick time backed up by Bech to take a 4-2 but followed by Kenneth Hansen’s in the tactical ride to take a 5-3 heat despite Richard Lawson’s race win. Watt secured his third heat win of the evening with Mikkel Bech once again aiding him in 2nd and Ben Morely secured another heat win for The Hammers as they took another 4-2. Peter Karlsson was continuing his good vein of form with another 4-2 win as Ryan Fisher hit the barrier and stretched their lead to 39-23. However the tactical ride again swung the meeting back into contention as Hans Anderson won race 11 to take a 7-2 win. Max Fricke then snatched race 12 and substituted Jason Garrity took 2nd to take a vital 5- to bring it back to 42-35. Heat 13 and 14 were tense as the visitors won both with Anderson again and Hansen but The Hammers kept the heats level and were holding on to the points 48-41 as it stood. The final heat had The Bees top scorer Hans Anderson win the final race of the night with the tense crowd willing on Peter Karlsson and Davey Watts to see off the visitors and did taking 2nd and 3rd to secure all three points for The Hammers. This entry was posted in Sport and tagged Arena Essex, Coventry Bees, Elite League, Hans Anderson, Jason Garrity, Lakeside Hammers, Peter Karlsson, Speedway.